TORONTO, July 29, 2012 – Canadian pride and spirit and a nod to the past will proudly be displayed when Canadian athletes step onto the podium at the London 2012 Olympic Games. 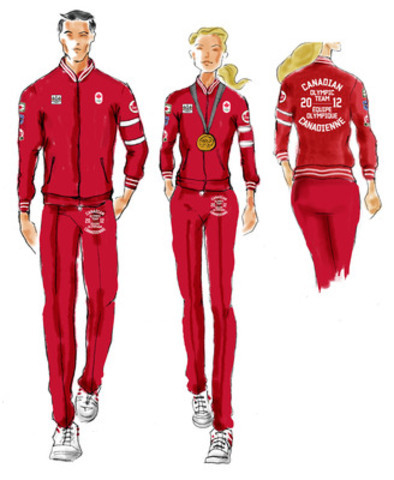 Sporting a Maple Leaf Red Canada track suit, the monochromatic look is retro with a modern, sporty spin. Created by the Hudson’s Bay Company exclusively for the Canadian Olympic Team, the red Podium Track Jacket combines elements of heritage, sport and the Olympic spirit. The jacket will be perfectly paired with matching track pants and topped off with a pair of sporty white sneakers for the complete Podium Look. A clean, modern take on the classic track jacket, the Podium Track Jacket is a full zip version featuring contrast stripe details on the rib trim. Also featured are the Canadian Olympic patches including a Canada Leaf and a large Team 2012 logo printed on the back. The overall effect has a strong graphic appeal making it a functional and stand-out piece for the Podium. The Podium Track Jacket in black and white is available at The Bay and Zellers as part of the 2012 Canadian Olympic Team Replica Apparel available for purchase at all Bay and Zellers stores from now until September 2012 and online at Thebay.com.